The Black Eagle (Ictinaetus malayensis) is a bird of prey. Like all eagles, it is in the family Accipitridae, and is the only member of the genus Ictinaetus (Blyth, 1843). 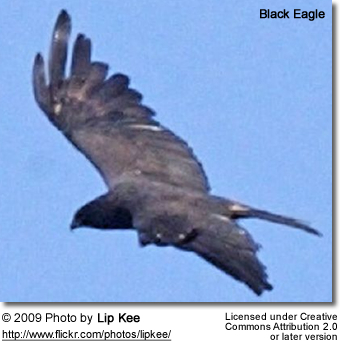 The Black Eagle breeds in tropical Asia. Race perniger (Hodgson, 1836) is found in the Himalayan foothills west through Nepal into northeastern Murree in the forests of the Eastern and Western Ghats in peninsular India and Sri Lanka. The species also extends into the Aravalli range of northwestern India. The nominate race malayensis (Temminck, 1822) is found in Burma, southern China (Yunnan, Fujian) and Taiwan, into the Malay Peninsula. They are generally residents and no migrations have been observed. The Black Eagle is a large raptor at about 70-80cm in length. Adults have all-black plumage, with a yellow bill base (cere) and feet. The wings are long and pinched in at the innermost primaries (longest wing feathers) giving a distinctive shape. The tail is also long, and shows faint barring. The wings are held in a shallow V in flight. Seen on hot afternoon, scouring the treetops for a nest, this bird is easily spotted by its jet black colour, large size, and a 'characteristic' slow flight, sometimes just above the canopy. Males and females look alike, but young birds have a buff head, underparts and underwing coverts. The wing shape helps to distinguish this species from the dark form of Changeable Hawk Eagle (Spizaetus cirrhatus). The Black Eagle eats mammals, birds and eggs. It is a prolific nest-predator and is known for its slow flight just over the canopy. The curved claws and wide gape allow it pick up eggs of birds from nests. Along with Swallow-tailed Kites they share the unique habit of carrying away an entire nest with nestlings to a feeding perch. Squirrels, macaques and many species of birds emit alarm calls when these birds are spotted soaring over the forest. The Indian Giant Squirrel has been noted as a prey of this species and young Bonnet Macaque's may also fall prey to them. The courtship display involves steep dives with folded wings with swoops up in a U shape into a vertical stall. They build a platform nest, 3 to 4 feet wide, on a tall tree overlooking a steep valley.